We were lazing about in Kep, Cambodia wondering how we should attack the next leg of our trip into Vietnam. We could catch a long haul bus to Ho Chi Minh, but we were growing pretty tired of long, sweaty bus rides by that stage of our 12 month trip. 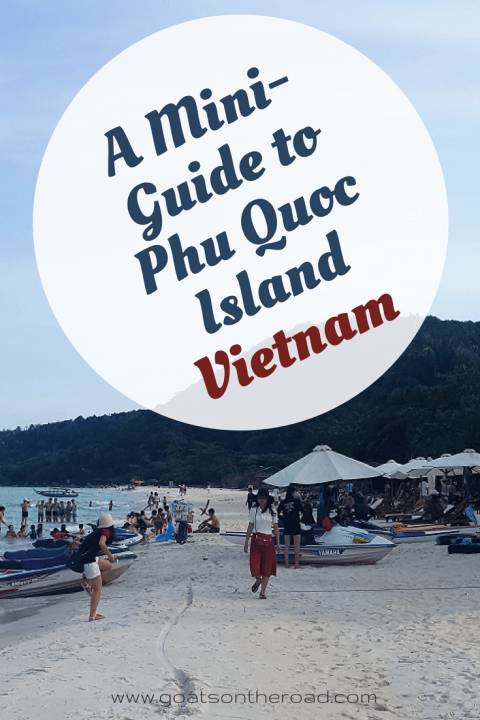 Instead, we decided to do a bus/ferry/plane combo which would take us via the tiny island paradise of Phu Quoc, off the southern coast of Vietnam. And we are so glad we did – because we may have just found Vietnam’s best beaches. Phu Quoc is the kind of place where you could get stuck for weeks just chilling out in a hammock. To be honest, there’s not much to ‘do’. Rather, there is this captivating laid-back, tropical vibe that seems to make it difficult for travellers to leave. We spent our days eating delicious street food sitting on tiny chairs by the side of the road, and cruising around on our scooter from beach to beach. Phu Quoc is mercifully free of tourists – you won’t find the ugly high-rise apartment blocks of Nha Trang here. There’s not much tourism infrastructure, which means you also won’t find the big party hostels here. Instead, you will be getting back to basics with a couple of hammocks and a fan. 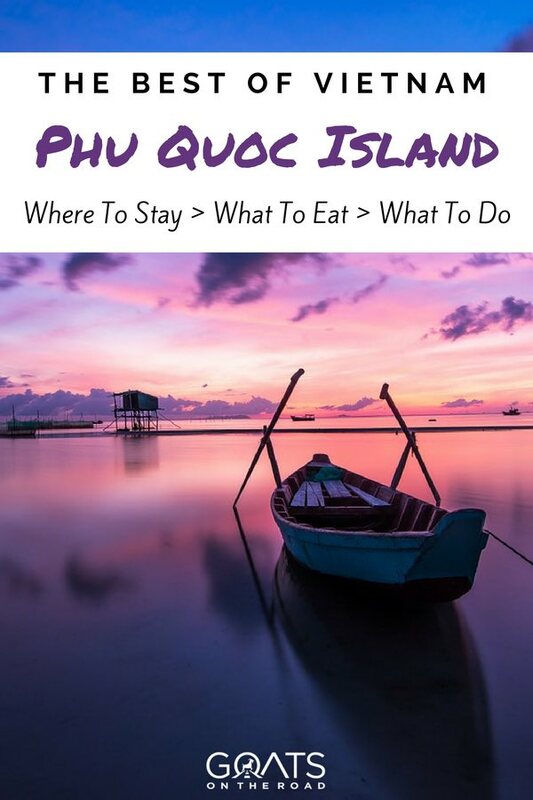 Phu Quoc is slightly more expensive than mainland Vietnam, given that everything needs to be flown or shipped into the island. But there are still budget food and accommodation options available if you look hard enough. We stayed at Island Life Hostel, which lacked air conditioning but made up for it with its cheap beers and relaxed atmosphere. There was also a good value motorbike hire shop conveniently located next door! 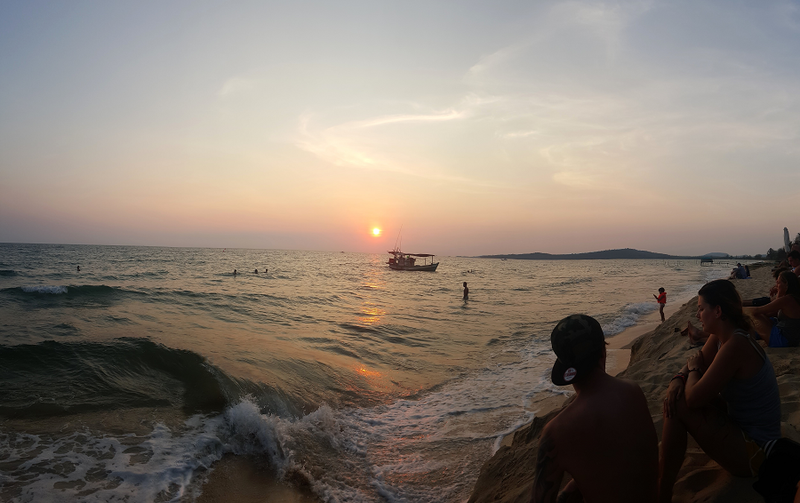 A word of warning: Phu Quoc is extremely hot so if you struggle with the heat then invest in a room with air conditioning. Our absolute favourite beach on Phu Quoc was Sao beach. This beautiful, white sand beach is quite isolated but that is what makes it so great. There are a few beach side bars dotted along the shoreline, where you can hire an umbrella and a beach chair to enjoy a cocktail or two while the sun slips below the horizon. Cua Can and Ong Lang beaches, located right next door to each other, are also a must-see. Take a couple of beers and escape the heat by going for a swim in the crystal-clear water. 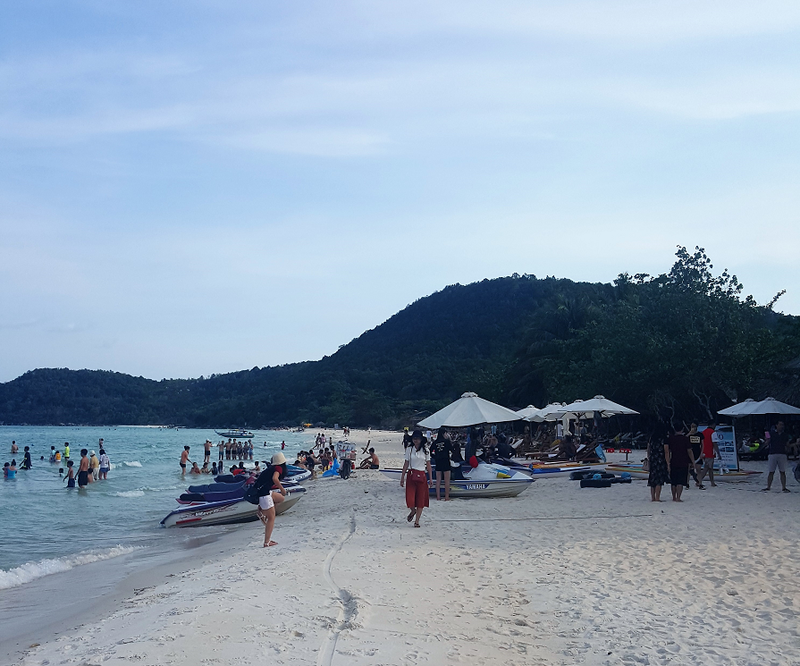 The beaches are also quite close to the town of Duong Dong, where there are a few cheap accommodation options if you don’t mind staying in a busy and kind of ‘meh’ town. There is pretty much no public transport on Phu Quoc. However, you will find heaps of motorbike/scooter hire shops dotted around the island. You can hire motorbikes for as little as US$8 per day (including helmets). Be prepared to bargain, especially if you are renting for more than a few days. The longer you are renting the cheaper it should be! Phu Quoc’s traffic is nothing like Ho Chi Minh or Hanoi. The island is pretty quiet traffic-wise, so even first-time motorbike riders can get around without too much hassle. You can buy a tank of petrol for just a few dollars – keep an eye out for plastic bottles with petrol sitting on the side of the road. Most of the island’s beaches are within an hour’s drive of each other. A word of warning: many travel insurance policies do not cover you for motorbike accidents, especially if you don’t have a motorbike licence at home. Check your policy carefully! The third option was much easier and not much more expensive than the other options, so we were sold! 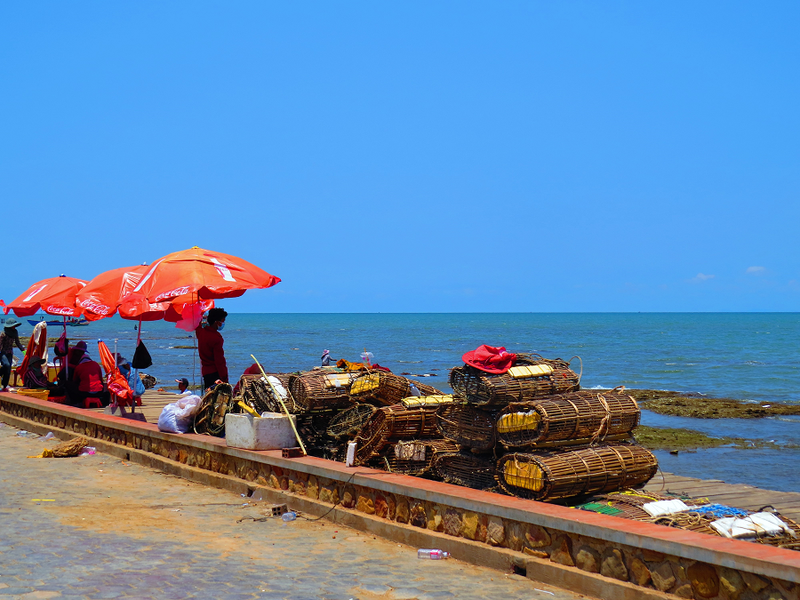 It meant we didn’t have to worry about buying ferry tickets when we arrived in Ha Tien. No stress about finding the ferry dock or missing the ferry altogether either. We bought our minibus/ferry package from Ana Tours in Kep for approximately US$20 per person. We didn’t have any problems, although we read mixed reviews online. A taxi collected us from our hotel then dropped us off at the travel agency, where we hopped on a minibus. The minibus drove us to the border, where we completed the border crossing formalities then re-boarded the same minibus. The border crossing was straightforward. We already had our Vietnamese visas (we organised these through our hostel in Phnom Penh). 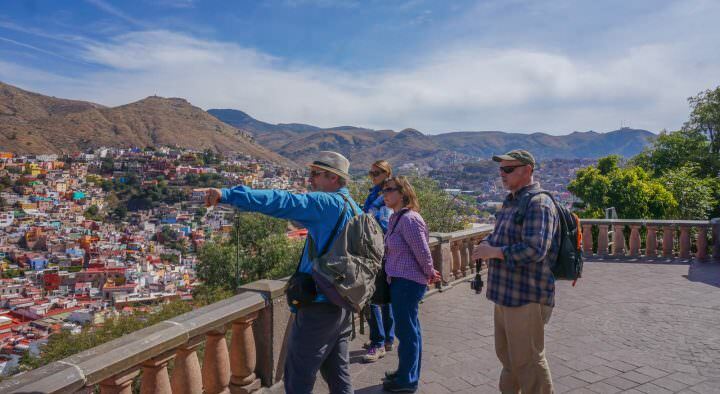 You may have to pay a couple of extra dollars to the border crossing officials. We loathe to say it was a bribe, but that’s pretty much what it was. After the border crossing, we were dropped off at a small restaurant at Ha Tien port, where we walked 30 metres or so to the Superdong Ferry. The Superdong Ferry dropped us at Vong Beach, where we caught a shared minibus for around 30,000VND ($1.30) to Duong Dong. There are no ATMs at the dock so have some small change ready! Then we asked a local to call us a metered taxi that took us to our hostel. You can also buy minibus/ferry packages from travel agents and hostels in Phnom Penh (around US$30 per person). 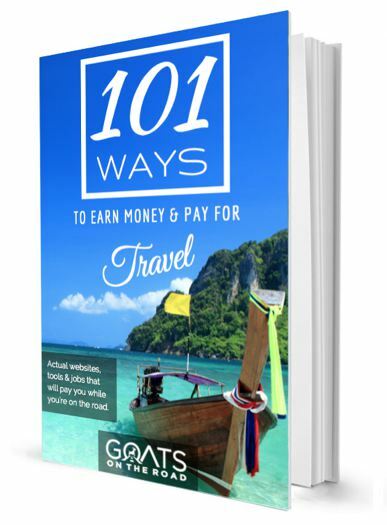 These will take you via Kampot and Kep. 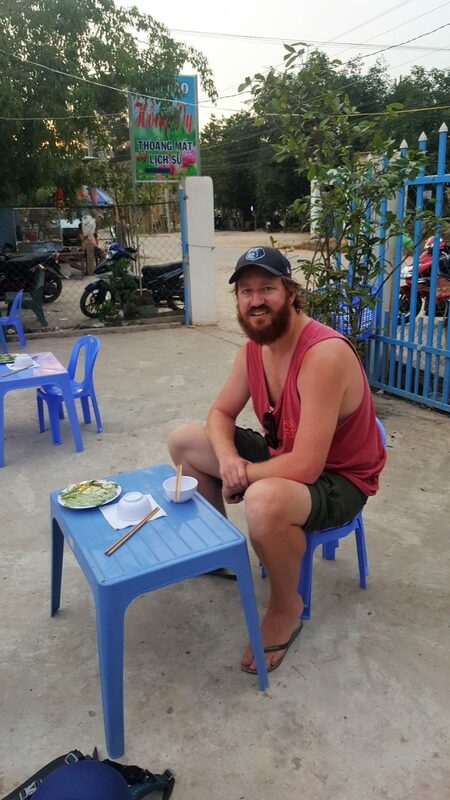 After a few days of cruising around on scooters, lounging by the beach, sweating uncontrollably and getting our first taste of an amazing array of Vietnamese food, we headed off to Saigon/Ho Chi Minh City. 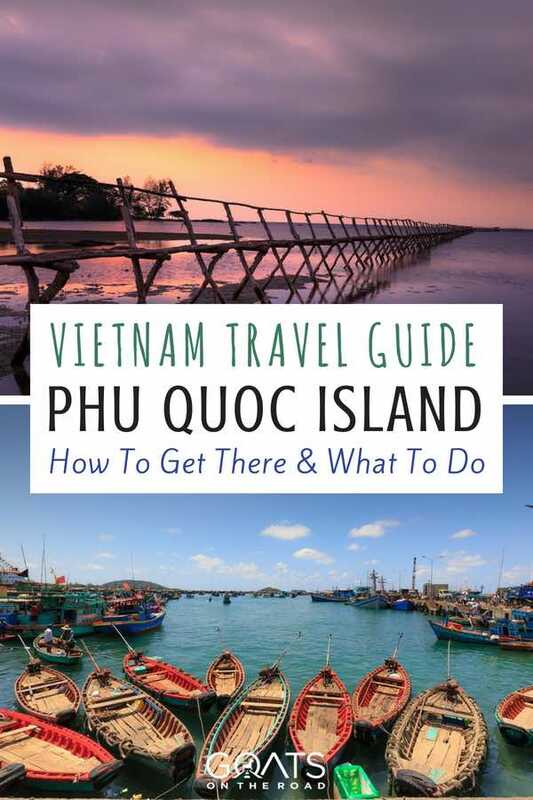 The cheapest and most convenient way to get from Phu Quoc to Ho Chi Minh is to buy a flight with Jetstar Pacific or Vietjet. The bus/ferry combo from Phu Quoc to Ho Chi Minh is often more expensive and takes A LOT longer! You can easily catch a taxi to the Phu Quoc airport from your accommodation on the island. Unfortunately, there’s not really any convenient public transport options to get to the airport. Where To Go in Vietnam – Top 11 Places You Won’t Want to Miss! 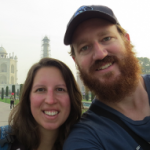 Tom and Katherine are the Australian couple behind The Travelators. 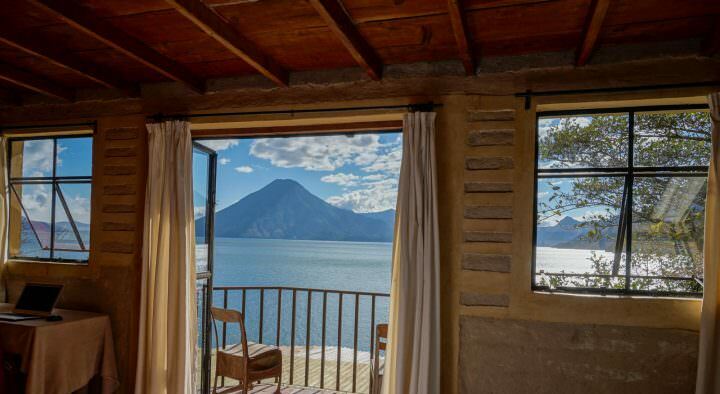 They’ve been backpacking the world together on-and-off since 2007, juggling their love of travel with study and work at home. 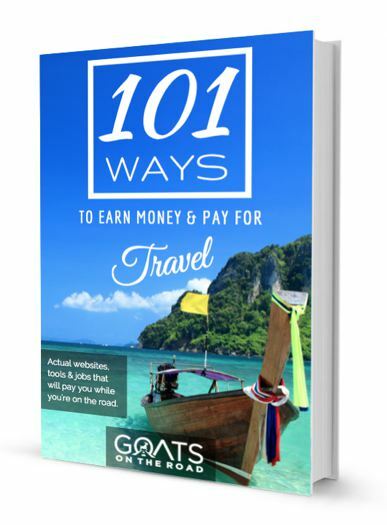 Their blog is all about taking career breaks to travel, and exploring the world on a budget. They’ve visited over 60 countries so far across Europe, the Middle East, the Americas and Asia – and they’re still counting! wow! What a wonderful article and post. You captured amazing pictures in your trip of beaches. I really like that place. Thank you so much for sharing it. Sounds beautiful. I’ve read some articles that say Phu Quoc is being built up quickly and some of the beaches were littered with plastic. Did you find that at all? 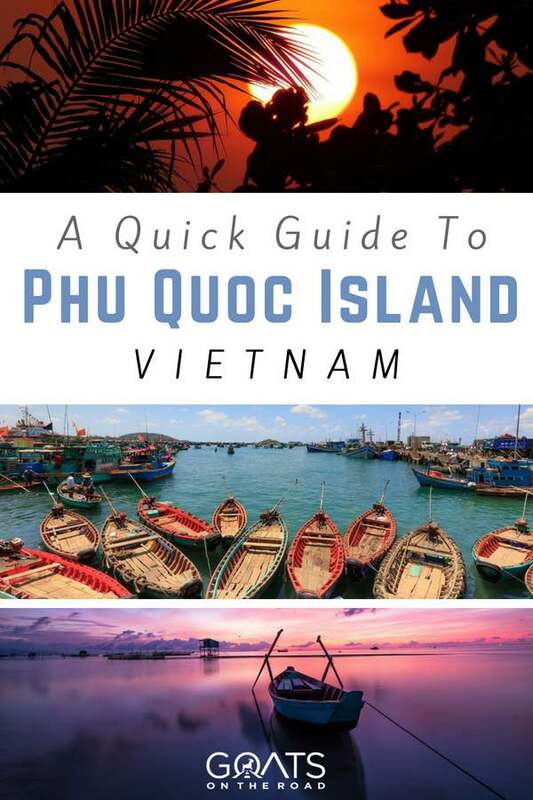 I’m planning a trip to Vietnam next year and was considering Phu Quoc for a few days. When we visited, it was 2008 and was pristine and totally underdeveloped. But, this article is a guest post from other writers, so I can’t say what it’s like these days… sorry! Nice wrap. I was thinking of hiring a moped but your point about travel insurance is absolutely true and got me rethinking. Maybe I’ll just do it for a day or two. We’re here in October and it’s like no traffic and no tourists.